Recently the Theatre Guild held its end of the year banquet and honored all of the participants in this year’s shows. Statuettes (think Oscars) were awarded in some serious and humorous categories by advisors, Joanne White and Kendra Donovan. Best actor was given to Ryan Struzziery for his leading role as Danny Zuko in Grease. Sophie McLellan won the best actress award in a leading role as Sandy. Shandi Austin won an award for Best Dancer and was recognized for her fine choreography in several shows throughout her four years, including Grease and A Chorus Line. Madison Parlee got the “techy award” for her indispensable work behind the scenes, and Michael Bodley was presented with an award for his solo performance in Grease that brought the house down on both nights last December. Kimberlie Jean-Poix received an award for hard work through the years as a Stage Manager. Morgan Foster was cited for being most supportive on and off the stage. Ali Landy received a Keeps Everyone Smiling award for her positive attitude. Several students spoke about the impact that being in drama had on them. Many stories were shared about the good times and bad times during rehearsals. . Many of the seniors talked about how drama club gave them a way to deal with their identity at RHS. Some spoke about transferring in from another school — and being part of drama helped them overcome their fears of a new place. Others spoke of their overcoming shyness, through drama. Many mentioned how Ms. White and Mrs. Donovan “saved” the drama club when they had no advisor to oversee them two years ago. Check out the photos below taken by Mrs. Adrienne Donovan. Statuettes presented to drama award winners on Friday, May 5. Megan Diver received an award as best teacher who is also a student at the Drama banquet on Friday, May 5. Sophie McLellan gives her farewell speech on the night of the drama banquet. Madison Parlee received an award for her outstanding tech work for the drama department. Ms. White and Mrs. Donovan prepare to present cords to the seniors. Shandi Austin gives a farewell speech at the drama banquet. Kimberlie Jean-Poix was recognized for outstanding work as a stage manager. Morgan Foster received a certificate for being the most supportive on and off the stage. Students get to look at a slide show of the year’s performances and behind the scenes. 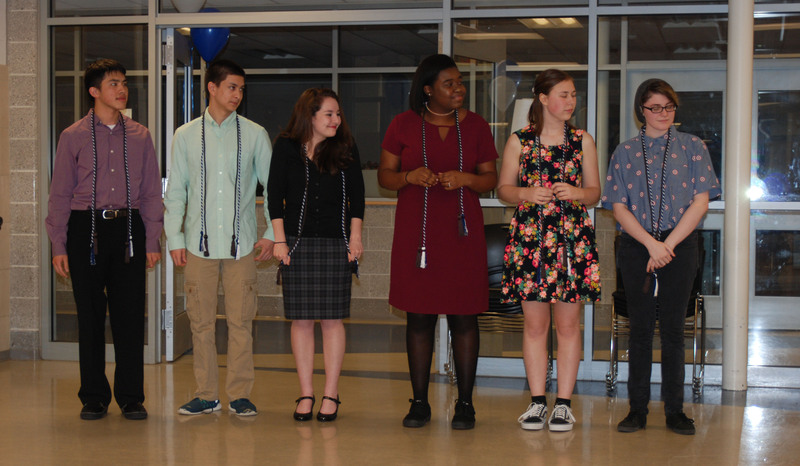 Six seniors Sean Vo, McLellan, Austin, Kimberlee Jean-Poix, Morgan Foster and Michael Belmonte received cords to wear outside their gowns on Graduation night. These signify the seniors’ participation in the drama program. Sean Vo, Michael Belmonte, Sophie McLellan, Kimberlie Jean-Poix, Morgan Foster and Shandi Austin receive cords to wear on their graduation day. photo by Mrs. A. Donovon.